Over the weekend my mom took my son Denzin and his nephew to a local Jersey farm to pick fresh tomatoes, cucumbers, peppers and zucchini. She gave me a box full of goodies and I decided to make my favorite grilled veggies salad. The dish came out so yummy that I was inspired to share the recipe with the world. While most grilled veggies are served with a little more than olive oil and salt, my way gives them bursting flavor and taste. The credit goes to my late grandma Mirkah who used to make this dish in the summer and early fall with fresh veggies straight from her greenhouse. Once you make it you would never want to eat your grilled veggies any other way. Seriously, it’s that good! Soak zucchini and red peppers in fruit and veggies wash for five minutes to remove any traces of pesticides or waxes. Rinse and process according to instructions above. 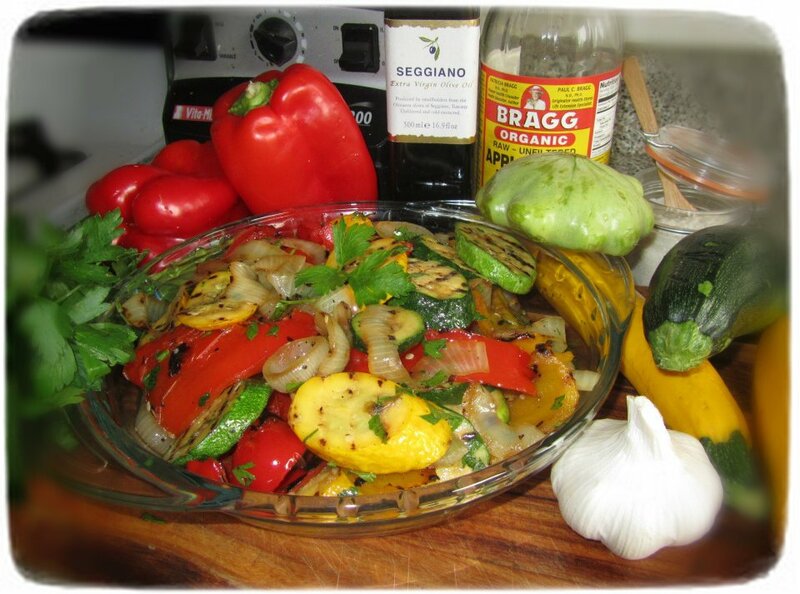 Put cut veggies in a large bowl and drizzle with EVOO just so you coat them but not saturate. Preheat your grill. I use indoor portable cast iron grill plate. Get one if you do not have access to an outdoor grill. 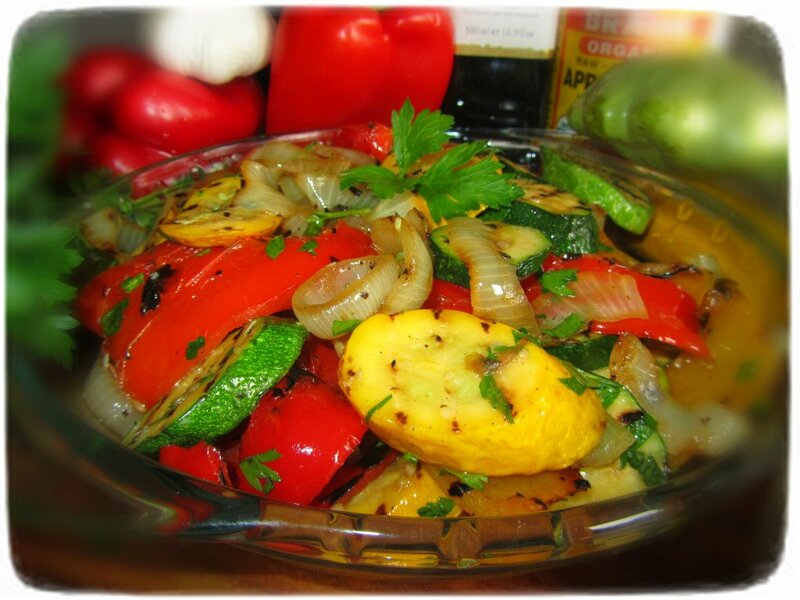 Place zucchini and red peppers on grill and cook for approximately 3-5 minutes on each side. Peppers may take you a little longer. When you are finished with the zucchini and the red peppers, place Vidalia onion slices on the grill but be careful not to separate them.Drizzle EVOO on top. Cook until light brown marks form on each side. Place grilled zucchini, red peppers and Vidalia onion slices into a clean mixing bowl. Add the parsley, garlic, vinegar and salt. Mix well and enjoy! Whichever way you decide to use this salad, you would absolutely love it! Sounds delicious Zoe! Sorry I missed you when you were out here in LA. If you come out again let me know. I’m about 30 minutes away in Orange! Cheers! Great dish – just what I was looking for. I bought these Gluten Free Brown Rice Tortilla Wraps from Trader Joe’s and now I know exactly what I will do with them. Thanks. Nancy – enjoy! It should like a great meal. Zoe bravo ,mnogo hubava retsepta.Badi blagoslovena! Ah, Marianche, mersi! Dano da ti haresa. hi ! the grilled veggies sound good but it did not state what to do with the yellow squash ? is the yelloe squash actually zucchini ? and what is EV olive oil ?